Salman Khan by analyzing the fact that human brain likes accepting things in small packets, he used to upload small videos of 10 minutes which was that time (2006) allowed to upload on YouTube. His videos got very popular and people from all round the globe started sending letters of appreciation to him and praised him for his noble cause of free education to everyone. He then left his Job from Hedge funds and devoted full time in his free education to all organization. 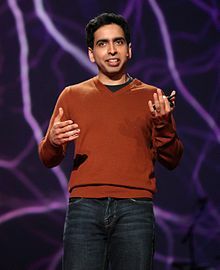 His organization KhanAcademy is now one of the most famous academy in the world and receives millions of donation from many people like +Bill Gates, +Carlos slim helu and many more for expanding his class and helping more and more children to learn easily. Salman Khan has four degrees and one is from +Massachusetts Institutes of Technology (MIT).